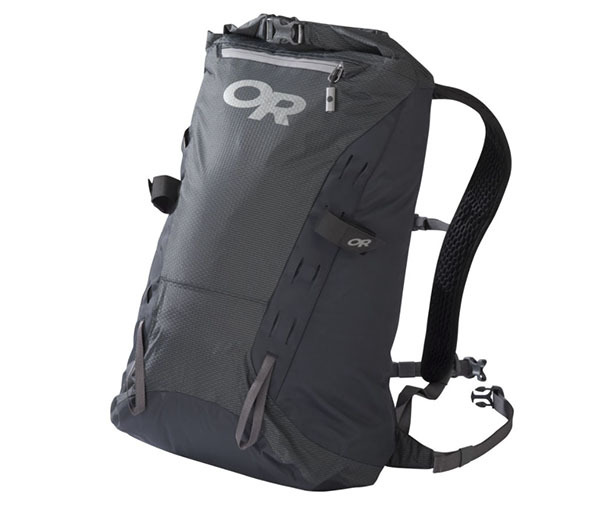 A minimalist, waterproof alpine pack, the Dry Summit Pack LT weighs in at 11.3 ounces—with a carrying capacity of 25 liters. Polyurethane coated nylon and a rolltop closure keep your stuff dry as you race down from the summit or hustle down the trail back to the car during a surprise (or just surprisingly intense) rainshower. Dimensions: 21 in. X 11 in. X 6 in. Dry Bags are not intended to be submerged for extended periods of time. Roll-top closure must be closed correctly (rolled 3 times and buckled) to keep contents dry. Pack electronic equipment with extra care (double bagged or in special waterproof hard cases) to prevent water damage as some moisture can enter the bag. Contact with abrasive or sharp objects can compromise integrity and waterproofness of this pack.